Matthew Budwill is a mild mannered system administrator by day, but in his free time he’s an adventure seeking storm chaser! The Rio Salado College employee has been chasing storms in Arizona and across the country for the last 15 years. He started out as an amateur doing time-lapse photography at night and has evolved through both training and experience into a certified SKYWARN spotter. Budwill received training as a storm spotter from the National Weather Service. As a certified SKYWARN spotter, he is able to report severe weather events and storm damage to any NWS office. “While I’m out, I issue weather reports to the national weather service that allows them to issue warnings. I send in damage reports so they can analyze what happened during a storm. And of course if someone is broken down or a victim or something, I’m able to stop and assist,” Budwill said. Although he has had some formal training, quite a few of Budwill’s skills were self-taught or incidental. “I was looking for new technology to use so that while I’m out I can upload GPS data in real time. Along with that technology, came training for how to more safely maneuver around tornadoes and such,” he said. 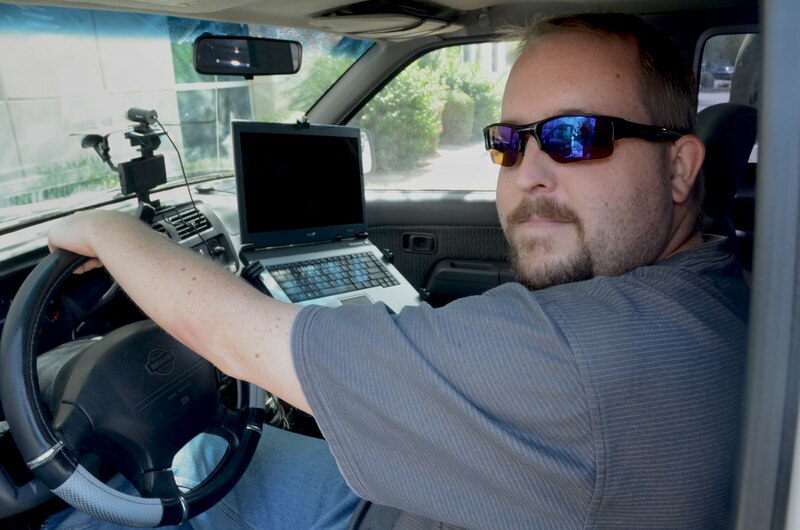 Budwill operates completely out of his truck which is equipped with GPS, full internet capability, three hand held cameras, and a high definition dash-cam capable of streaming live video to his Web site, www.statikstudios.com. He also has a dew point sensor that he engineered himself. “It’s based on a fairly standard design, but it took 3 years of trial and error to get it the way I wanted it,” Budwill said. The truck also has custom headlights and a light bar that can be seen from up to 10 miles away. Budwill can track his location through an iPhone app called Radar Scope which helps him keep a safe distance. “I will chase pretty much anything because I’m trained to, but I didn’t want to chase that one because I didn’t feel safe,” Budwill said. “I’ve almost been struck by lightning five times, which is five times too many.